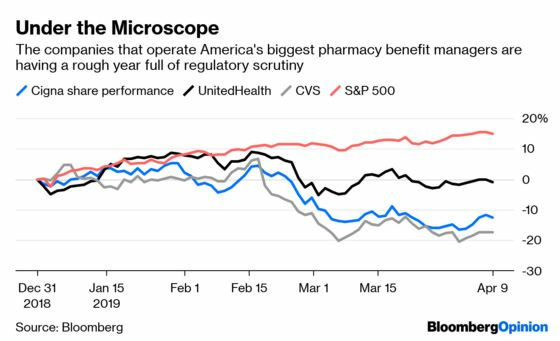 (Bloomberg Opinion) -- When it comes to addressing why U.S. drug prices are so high and assigning blame for what many call a broken system, the big pharmaceutical companies have always been a prime target. Increasingly, though, the focus has shifted to the middlemen in the process – namely, pharmacy benefit managers such as CVS Caremark and OptumRx that negotiate drug prices for health plans. These companies are supposed to keep costs down, but critics contend that they sometimes do the opposite in pursuit of profit. They're a focus of the Trump administration's drug-price reform efforts as well as state probes, and on Tuesday, leading executives from the industry were called in front of the Senate Finance Committee to answer for themselves. Pharma CEOs already made it through their own big-ticket hearing in February; it had its uncomfortable moments, but the executives made it out relatively unscathed. This time around, the senators seemed to have done their homework, and the PBMs didn’t get off quite as easily. PBMs say they help to keep down patient expenses by compelling drugmakers to offer discounts on the list prices they charge for medicine. 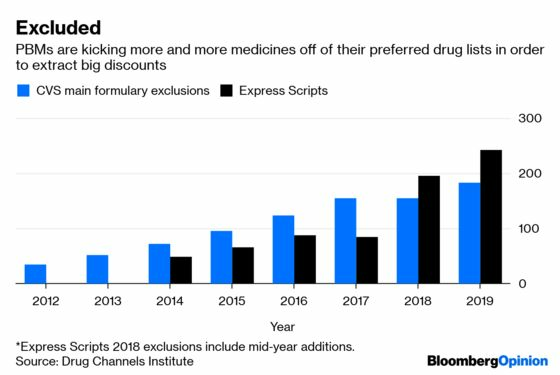 The most heavily discounted medications get market share from the PBMs and the plans they back, while the losers become more expensive and difficult to obtain. The system sometimes works, but there are catches. Those discounts often take the form of rebates that don’t always bring down costs for patients. There’s an incentive for drugmakers to hike prices to offer bigger discounts, and for PBMs to favor more expensive medicines because they’ve historically kept a portion of rebates for themselves. The executives noted at Tuesday’s hearing that retained rebates are a small or nonexistent part of their business, and their efforts are focused on keeping prices low. The senators were skeptical, and rightly so: These companies reap plenty of profit from this opaque system via a variety of other methods, and the committee was interested in many of them. The Senate panel pushed the executives on everything from spread pricing – when PBMs charge plans for drugs at a price that can be dramatically higher than what they end up paying pharmacies – to the gritty details and financial incentives behind the decisions over which drugs they cover. The scrutiny will continue Wednesday with a House Energy and Commerce hearing focused on the rising cost of insulin that will question executives from the three largest PBMs alongside representatives from three drugmakers that manufacture the product. Specifics matter, and senators at Tuesday’s hearing showed they know it. Texas Republican John Cornyn asked the executives to provide the total amount of money PBMs obtain from drugmakers in any form, along with the total amount that gets remitted to health-care plans. That doesn’t sound exciting, but it’s a real effort to obtain the sort of closely held information that could reveal things the industry wants to hide, and it could help guide policy intervention. The committee sent letters to the three biggest PBMs last week – CVS Health Corp, UnitedHealth Group Inc.’s OptumRX, and Cigna Inc.’s Express Scripts – asking for even more granular information. In one colorful moment, Louisiana Republican Bill Cassidy described a common PBM defense of the current model – that clients use rebate payments to keep premiums low – as a “kind of a reverse Robin Hood,” in which the sick are robbed to give to the healthy. He’s not wrong. In the current system, patients that take expensive medicines sometimes subsidize people that don’t. It wasn’t all bad. Some senators acknowledged that PBMs are one of the few forces pushing back against pharma’s pricing power. It’s no surprise, for instance, that drugmakers have cheered Trump administration plans to send any rebates on drugs used in Medicare directly to patients, a move that would squeeze PBMs but also potentially leave pharmaceutical companies with just as much profit as they have now. “The pharmaceutical industry has been able to take pressure on their pricing and turn it into with political jujitsu of an almost magical variety pressure on their greatest adversary,” Rhode Island Democrat Sheldon Whitehouse said. This is true. But the hearings drew attention to the need for simplicity and transparency in an industry where those are often bad words. Congress has the power and possibly the will to go further, and every participant in the drug-pricing process should take the added scrutiny as a warning.